You use a sextant to measure a body’s angular displacement above the horizon. The celestial horizon is a plane passing through the earth’s center perpendicular to the zenith-nadir axis. The visual horizon approximates this plane at the earth’s surface. Figure 8-13 depicts the zenith-nadir axis and the celestial horizon. The angular displacement you see through a sextant is the height observed (Ho). Ho is measured along the vertical circle above the horizon. The vertical circle is a great circle containing the zenith, nadir, and celestial body. The body’s altitude is the same whether measured at the earth’s surface from an artificial horizon or at the center of the earth from the celestial horizon, because these horizons are parallel and the light rays from the body are essentially parallel. Figure 8-14 shows that the infinite celestial sphere makes the difference in angle for light rays arriving at different points on the earth infinitesimal. Figure 8-13. 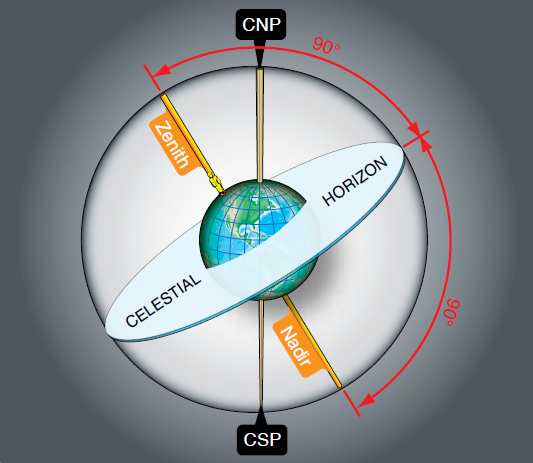 Celestial horizon is 90° from observer Zenith and Nadir. Figure 8-14. Parallel lines make equal angles with parallel planes. The angle between light rays is called parallax. In Figure 8-15, parallax is shown at its maximum; that is, when the observer and the subpoint are separated by 90°. Since the earth’s radius is tiny compared to the infinite distance to the stars, the angle p is very small. 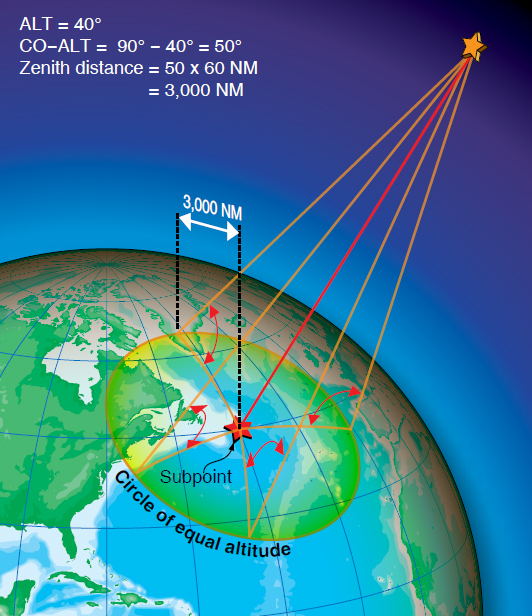 For the sun, angle p is a negligible 9 seconds of arc or 0.15 nautical miles (NM). 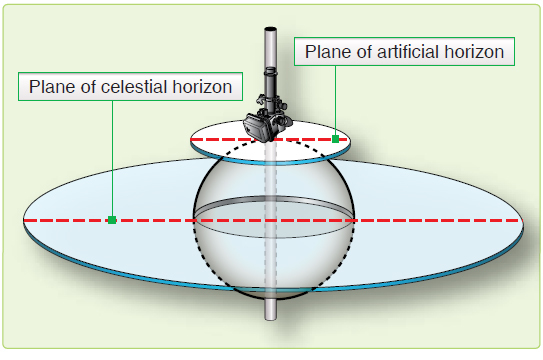 Observed altitudes from either the artificial or celestial horizon are practically the same. The bubble in a sextant or artificial horizon is most used by navigators. As in a carpenter’s level, a bubble indicates the apparent vertical and horizontal. With the bubble, the navigator can level the sextant and establish an artificial horizon parallel to the plane of the celestial horizon. Figure 8-16 shows that the plane of the artificial (bubble) horizon and the plane of the celestial horizon are parallel and separated by the earth’s radius. Compared to the vast distances of space, the radius of the earth is inconsequential. Thus, the artificial horizon and the celestial horizon are nearly identical. Figure 8-16. The two planes are parallel. The distance of the observer from the subpoint and a body’s Ho are related. [Figure 8-17] When the body is directly overhead, the Ho is 90°, and the subpoint and the observer’s position are collocated. When the Ho is 0°, the body is on the horizon and the subpoint is 90° (5,400 NM) from the observer’s position. (See Figure 8-18, where C is the center of the earth, AB is the observer’s horizon, and S is the subpoint of the body.) Since the sum of the angles in a triangle equals 180°, the angle OX is equal to 180° – (Ho + P). The sum of the angles on a straight line equals 180°, so angle OXC is equal to Ho + P. The horizon AB being tangent to the earth at O is perpendicular to OC, a radius of the earth. Thus, angle OCX equals 90° (Ho + P). The preceding discussion showed that angle P is negligible, so this angle becomes 90° – Ho. The arc on the surface subtended by the angle OCX at the center of the earth is arc OS. This arc then is equal to 90° – Ho. Figure 8-17. 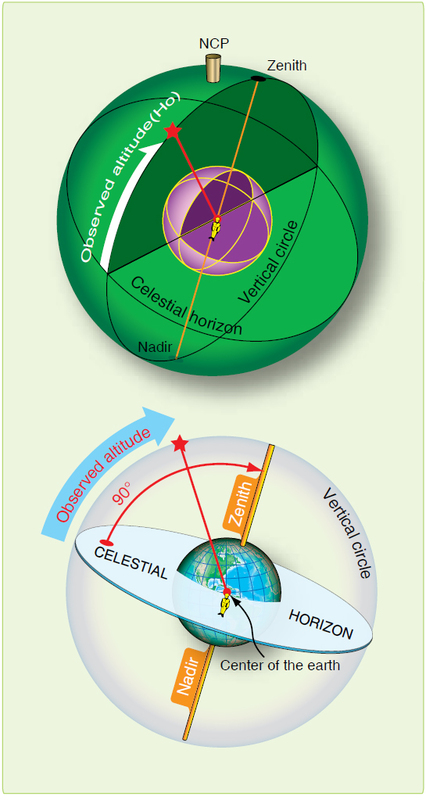 Measure altitude from celestial horizon along vertical circle. Figure 8-18. Finding observed altitude. The distance from the subpoint to the observer is the zenith distance or co-alt and is computed using the astronomical triangle described in Chapter 9. Basically, the zenith distance equals 90° minus the Ho. [Figure 8-19] The figures are then converted to NM by multiplying the number of degrees by 60 and adding in the odd minutes of arc. Zenith distance is the radius of the circle which becomes the celestial LOP. This circle is called the circle of equal altitude [Figure 8-20], as anyone located on it views an identical Ho. Now that you can determine the distance to the subpoint, you must next find the direction. Figure 8-19. 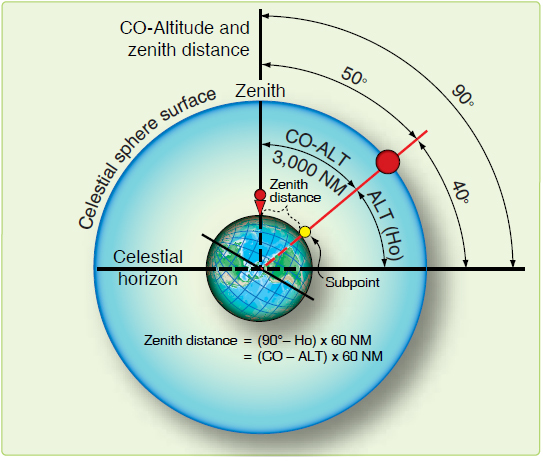 Co-altitude and Zenith distance. Figure 8-20. Constructing a circle of equal altitude. The direction to a body from an observer is called Zn. 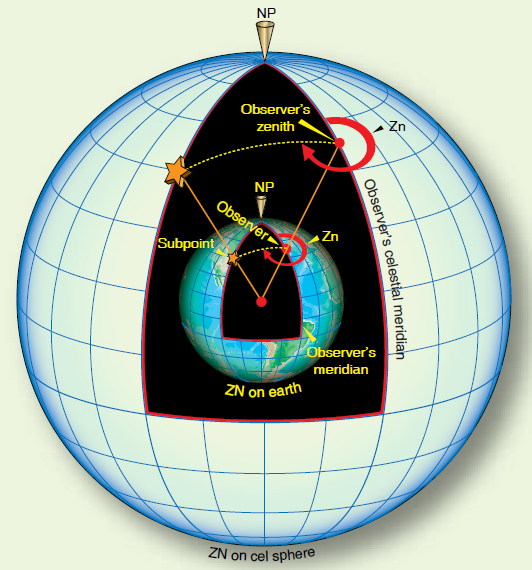 A celestial body’s Zn is the true bearing (TB) to its subpoint. The Zn is the angle measured at the observer’s position from true north (TN) clockwise through 360° to the great circle arc joining the observer’s position with subpoint. [Figure 8-21] If you could measure the Zn when you measure its altitude, you could have a fix. Unfortunately, there is no instrument in the aircraft that measures Zn accurately enough. Except in the case of a very high body (85–90°), if you observe a body with a Ho of 40° and you mismeasure the Zn by 1°, the fix will be 50 NM off. Figure 8-21. Relationship of true azimuth to an observer. Since you cannot normally fix off a single body, you usually need to cross two or more LOPs. The fix position is the intersection of the LOPs. When two celestial LOPs are plotted, they intersect at two points, only one of which can be your position. In practice, these two intersections usually are so far apart that DR removes all doubt as to which is correct.